Shezmu, alts. Shesmu, Schezemu, Schesmu, Shesemu, Shezmou, Shesmou, Sezmu, Sesmu, is the ancient Egyptian demonic God of execution, slaughter, blood, and wine. Like many of the gods of Ancient Egypt, Shezmu was of a complex nature. He had qualities of both light and darkness, but this was not the reason that he was known as a 'demon'. To the Egyptians, demons were not necessarily evil in nature. Often they were quite helpful. Instead, the term 'demon' was given to Shezmu because he was one of the lesser deities, and due to his relation to The Underworld. Though he wasn't as popular as many of the others, he was quite important. Shezmu was the demonic god of red wine, slaughter, and sometimes perfumes or oils. The link between blood and the crimson color of wine is clear. Shezmu was known to destroy wrongdoers, gruesomely putting their heads in winepresses to remove the blood. He was known as the 'Executioner of Osiris'. Shezmu followed the commands of The God of The Dead, and therefore was sometimes given the title 'Slaughterer of Souls'. He initially seems to be a fierce underworld deity, but Shezmu was quite helpful to the dead. Although he was a harsh executioner of the wicked, he was also a great protector of the virtuous. Shezmu offered red wine to those who had passed on. Other than wine, he was in charge of earthly objects such as embalming oils, and perfumes. Among the gods, his job was to use the bodies and blood of the dead to create sustenance for Unas. Osiris was the one who ordered the use of the wicked one's blood to be turned to wine. He was sometimes given the title 'Demon of the Wine Press'. On a darker note, Shezmu's affinity with the color red linked him to evil. Crimson was a feared and hated color among the Egyptians. Not only is it the universal color of blood, and therefore death, but it was the color of the god of chaos, Seth. Since it was also the color of the setting sun, red was associated with the coming darkness and the reign of Apophis the serpent demon. Like many other Egyptian deities, Shezmu was sometimes depicted as a man or a man with the head of a falcon. To link him further with blood and destruction, he took the form of a man with a leonine head. This perhaps was a bridge between him and Sekhmet, the goddess of vengeance. Furthermore, he is associated with Nefertem through both his appearance and the connection with perfumes. Shezmu seemed to be both represented as a great evil and an entity of good. In many places he is held in high regards by the god Osiris, and is worshipped as a protector god. However, he was also feared as the unyielding punisher of the damned. His greatest cult was centered in Faiyum, but his worshippers were also widely distributed in Dendera and Edfu. Due to its color, red wine became strongly identified with blood, and thus Shezmu was identified as lord of blood. Since wine was seen as a good thing, his association with blood was considered one of righteousness, making him considered an executioner of the unrighteous, being the slaughterer of souls. When the main form of execution was by beheading, it was said that Shezmu ripped off the heads of those who were wicked, and threw them into a wine press, to be crushed into red wine, which was given to the righteous dead. Beheading was commonly carried out by the victim resting their head on a wooden block, and so Shezmu was referred to as Overthrower of the Wicked at the Block. This violent aspect lead to depiction, in art, as a lion-headed man, thus being known as fierce of face. 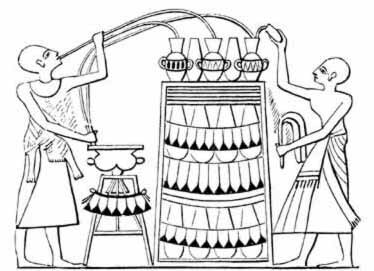 In later times, Egyptians used the wine press for producing oils instead of wine, which was produced by crushing under foot instead. Consequently, Shezmu became associated with unguents and embalming oils, and thus the preservation of the body, and of beauty.